It’s that spine-chilling, bone-shaking, fantastically eerie time of year. Porch decorations are swaying in the cold autumn wind, cavity-inducing candy has engulfed grocery stores and kids are ready to hit the streets to trick-or-treat! After you’ve finished binge-watching your favorite Halloween TV specials, check one of these new DVD releases. They are sure to offer up some last-minute costume inspiration, including Diana in the horror flick Lights Out from producer James Wan, director of The Conjuring. Looking for something a little edgier? Vee (Emma Roberts) or Ian (Dave Franco) provide many interesting wardrobe choices throughout the adrenaline-charged film Nerve. 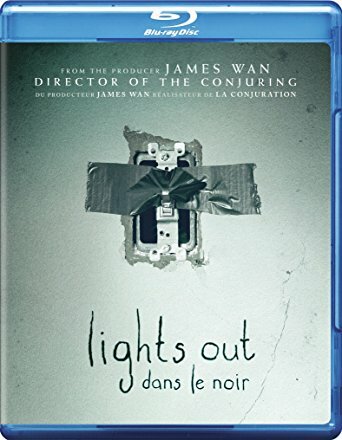 Lights Out – A little boy named Martin (Gabriel Bateman) sees a woman in the shadows every time he turns off the lights. He learns that his big sister Rebecca (Teresa Palmer) also used to experience the same thing. It turns out that their mother Sophie (Maria Bello), while in a mental institution as a child, made friends with a girl named Diana whose skin had a strong negative reaction to bright light. While undergoing light therapy, she died. Diana has returned from the dead and she wants her friend back — at the expense of the children. Nerve – Vee (Emma Roberts) learns about a website called Nerve, in which watchers pay to watch (and comment on the players) and players get a series of increasingly dangerous dares that earn them an increasing amount of money. She meets Ian (Dave Franco), who turns out to be a Nerve player too. Dare after dangerous dare, they continue to play together, even when the game involves guns. The game escalates and Vee is faced with a difficult decision. Will she go as far as murder? Based on the young adult novel by Jeanne Ryan. Captain Fantastic – Ben (Viggo Mortensen) is a devoted father of six children. They live a secluded life in the isolated forests of the Pacific Northwest. The children, who rarely come into contact with any other people, are raised on a rigorous physical and intellectual schedule. When their mother commits suicide, the children want to attend her funeral. Against his better judgment, Ben takes them on the journey, only to find that his late wife’s parents want to take custody of the children away from him. Blood Father – Ex-con John Link (Mel Gibson) is living as a tattoo artist in a dilapidated trailer deep in the desert. He hasn’t seen his 16-year-old daughter (Erin Moriarty) in many years, until she calls him one day out of the blue. She’s in some kind of trouble, the kind that sends a group of gun-toting gangsters blazing into Link’s quiet existence. He must now risk his parole and his life in order to save his little girl from a gang of ruthless drug dealers looking for revenge. The Daughter – After a 15-year absence, Christian (Paul Schneider) returns home to rural New South Wales for the marriage of his wealthy father Henry (Geoffrey Rush) who owns a local mill. During his stay, Christian reunites with his old friend Oliver (Ewen Leslie) and feels drawn to Oliver’s family, including his wife Charlotte (Miranda Otto), his daughter Hedvig, and his father-in-law Walter (Sam Neill). The community, especially Oliver’s family, is shaken when Henry announces the closure of the mill and bitter family secrets bubble to the surface. Christian threatens not only his own safety, but that of his family as he unravels his family secret. Le Dep – Returning to her small First Nations community in Outaouais after several years away, Lydia takes a job at her father’s convenience store. One night she has to work alone until closing, much to the chagrin of her boyfriend, a police officer who was hoping to spend time with her. Lydia is responsible for preparing the community’s welfare envelopes, with $50,000 that has been left in the safe. A masked and armed individual enters the store and orders Lydia to give him the money. When she realizes she knows the identity of her assailant, Lydia is forced to make a difficult decision. Standing Tall – Abandoned by his mother when he was just six, Maloney (Rod Paradot) is constantly in and out of juvenile court. A juvenile judge nearing retirement named Florence Blaque (Catherine Deneuve) and a caseworker with a rough childhood named Yann (Benoît Magimel) come to believe that they can help young Maloney and save him from his life of crime. In an attempt to curb his reckless ways, Maloney is sent to a stricter educational center, where he meets Tess (Diane Rouxel), a special young girl who reignites his hope for a better life. In French with English subtitles. Heidi – When her Aunt Dete gets a job in Germany, Heidi, a sensitive and high-spirited orphan, has to go live with her grandfather in the Swiss Alps. As the months go by, Heidi begins to love her new home and spending time outside on the beautiful mountain with her new friend, Peter the goatherd. Her happy days are cut short when Dete returns and takes Heidi to Frankfurt to live with a wealthy family. Heidi meets Clara, a paraplegic girl who notices that Heidi, despite efforts to remain cheerful, is homesick for her grandfather, Peter and the Alps. King Dave – Underneath his tough guy exterior, Dave is scared. But he’s clever and persistent. When Dave attends a party, he ends up making the acquaintance of the leader of a street gang. He’s immediately enlisted in the gang and as initiation, has to steal radios from luxury cars. However, when a gang member flirts with Dave’s girlfriend, Dave decides to meet this dangerous man alone at night in a park to settle the score. captain fantastic was good. Weird, but good. Lots of limited releases in theaters this week, including James Franco's Tommy Wiseau biopic The Disaster Artist, the Alaskan thriller Sweet Virginia and more!